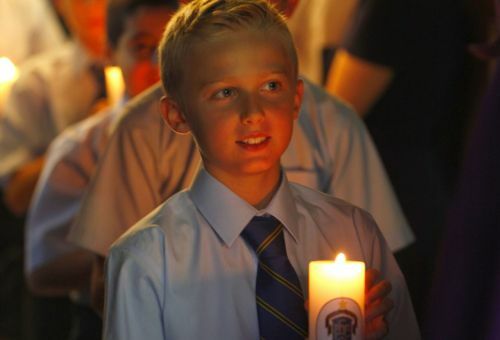 The Year 5 Welcome Mass and commissioning of the P&F Executive, showed in emphatic fashion that St Patrick’s College knows how to celebrate the things it values. Celebrant Fr Kim Ha, on his first visit to the College, remarked on the amazing sense of community and connection evident in the Mass celebrated last Tuesday. Prayers and readings were led by students, teachers and parents showing cooperation across the community. The Year 5 students were in good voice up in the choir loft, led by Miss Grapé and accompanied by Bailey Yeates on the organ. To draw the celebration to a close, the boys led their first public rendition of the College anthem – the first of many over the years to come. The generous contribution to the College community made by the P&F Executive Committee, was acknowledged and solemnified with a blessing and candle ceremony. This was presented by the Principal and Year 12 Student Leaders, led by College Captain, Matthew Bryson. Following the Mass, a beautiful supper supplied by a number of parents, and prepared by the P&F was enjoyed by all. On the whole, the event was a very fitting welcome to the St Patrick’s College community.